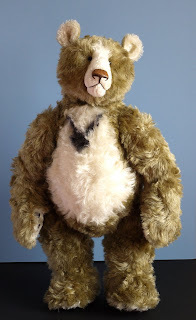 Every once in a while I bring together ideas in a bear which are purely for my own enjoyment, a bear which represents my latest thinking on this overall style of bear. I chose a slightly unusual colour, a greenish gold fur on a yellowish base, there are flecks of different colours in the fur including a very few black hairs. 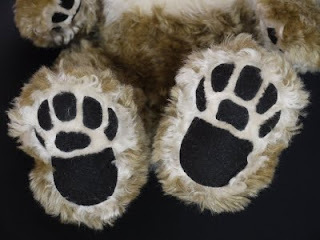 I wanted this bear to have some extra special details so I gave him applied foot pad detail, all done freehand and on a carefully shaped pad which takes up a very three dimensional contour when it is filled... they are made to be seen of course but carefully proportion so that Major will still stand comfortably. 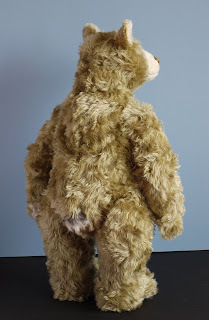 I have also added a streak of smokey grey on his chest to break up the plain white, a small detail which is repeated as a stripe through his tail. 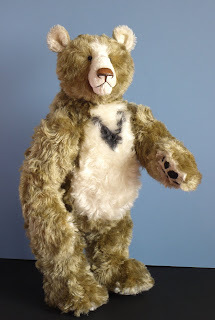 I have also included some evolutions to the pattern to improve posture and proportion. 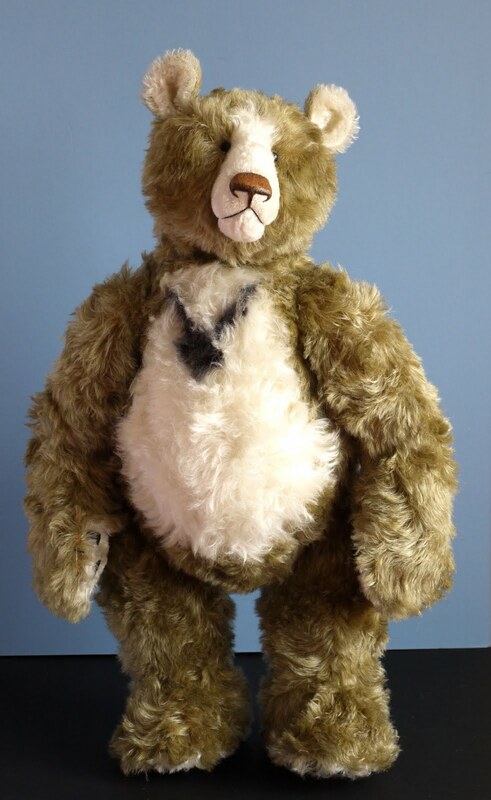 He is a six-jointed bear and stands approximately 23 inches tall. 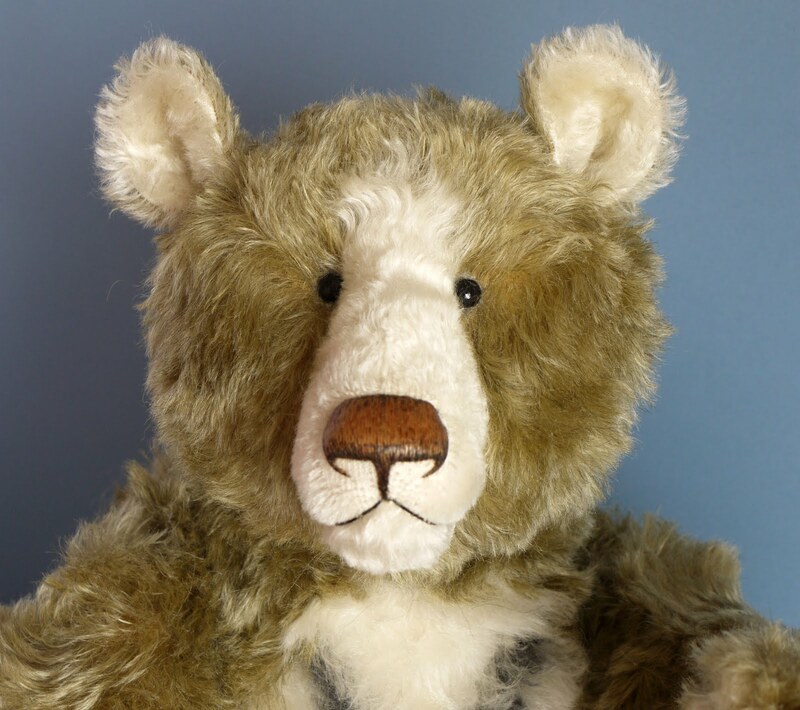 The eyes are vintage boot buttons chosen for their gentle look and his nose is my signature embroidered nose which has been set, shaded and wax polished to soft sheen. Major has a new home but if you would like to join my mailing list or see other information about the bears and my schedule please visit my website for more details. 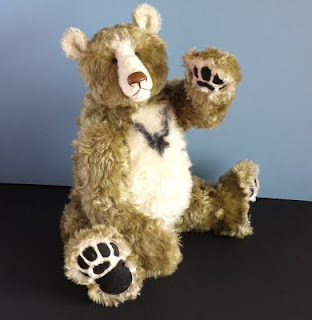 Having spent some time reworking the smaller bears, I have similarly reworked the larger standing bear pattern, he is a little taller to balance up the proportions and the first one from the revised parts is made from an unusual olive/green/gold mohair and he has extra treatment on his paws, photography this evening so I will have some photos very soon. 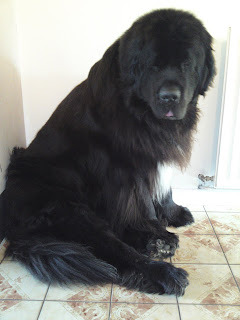 In the meantime I thought I would share this rather charming photo of Angus waiting for his breakfast this morning.